ThermalDry® Elite Plank Flooring installed by DBS combines the aesthetic of a real wood plank floor with the durability that comes from using an inorganic material. Available in a light and a dark color, you can decide which faux-wood look will suit your new basement office, den, bar, or any other space you're creating in your basement. All of our technicians are fully trained and certified to install this hassle-free flooring as a part of your basement finishing project. Ready for your free in-home consultation and estimate to decide which basement flooring is right for you? 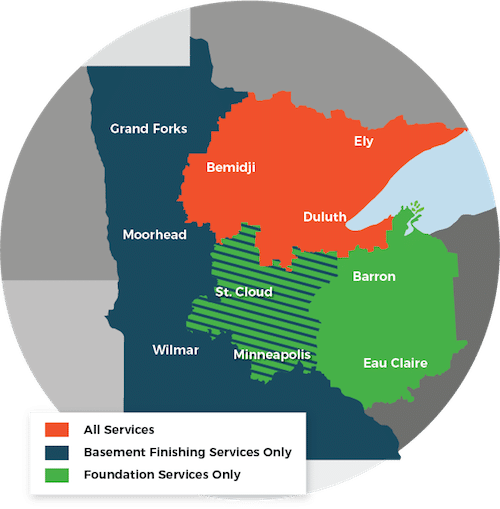 We serve customers in Duluth, Superior, Minneapolis and throughout the surrounding areas - schedule your free estimate today! It's easier than you think to create a finished basement that is not only water-resistant but that also matches the caliber of your home's design upstairs. ThermalDry® Planks are just one way you can convert a traditional, cherished look into a modern basement flooring solution. DBS has the skills and experience you need to complete your ideal finished basement. Interested in ThermalDry® Planks or any of our other basement flooring options? Call us at 1-855-259-9625 or contact us online to schedule a free estimate! We serve homeowners throughout Duluth, Superior, Minneapolis and the areas nearby.